To suit 160 and 220 deep Printed Circuit Boards and Plug-in Modules of Eurocard height. The 220 depth has a heavy duty version designed to withstand heavier loads across the span. 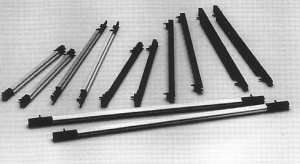 For PCB and Plug-in Module sizes outside the Eurocard standard, extendable Guide rails allowspanning any depth in Eurocard height and non Eurocard using end-caps that interconnect with an extruded intermediate section, cut to suit reverse side of the front panel. All Eurocard guides and end-caps are available in long and short nose, long nose for use with PCB ejector levers whilst the short nose are used where EMC panels are being fitted and/or additional component clearance is required on the reverse side of the front panel. 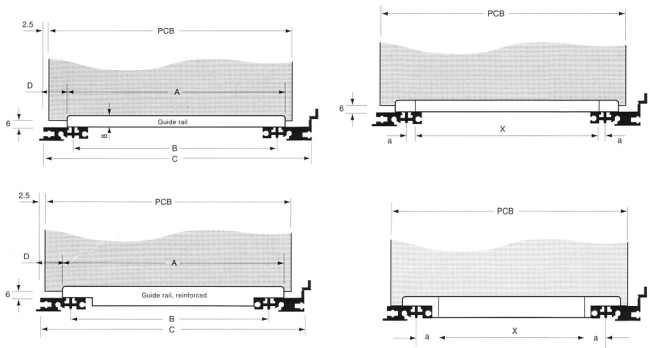 Anti-vibration protrusions are integral to the mouldings to protect the PCB and Plug-in modules during operation or transportation.